At Go Rubbish Go we provide top quality house clearance services to the people of Camden at low prices. Anyone in the local district who needs help with a Camden house clearance NW1 task can call our team. With years of experience in the industry, we know how to deliver a top-notch service, so call our team and you’re guaranteed to get what you asked for, and more. With us on board everything will be carried out systematically and will run like clockwork from start to finish, so you won’t have to worry about a thing. Call us on 020 8610 9182, arrange a time and date for us to get to work and we’ll take care of the rest. We’ll carry out the job exactly as requested so you won’t receive any unexpected surprises during the service. For cheap Camden, NW1 house clearance services, you should turn to us and only us. That’s because we’re a local house clearance company in N1 that has your needs at heart. Everything we do is geared towards ensuring you enjoy a simple time of it, you don’t have a strenuous experience, because we’ll be there to take on the load – literally. 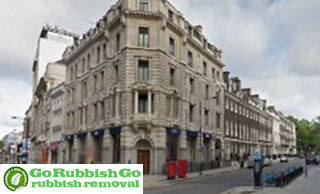 Go Rubbish Go are also renowned in Camden for offering all-round great value clearance services – services for house clearance Camden, NW1 that are remarkably priced considering the quality and standard of service on offer. So if you’ve been put off from hiring a clearance service in the past, call us on 020 8610 9182, have a free consultation with our team, learn about our price promise, and we’re sure you won’t be anymore. What makes our house clearance company better than the rest in Camden, NW1? It’s our experience in the industry, experience that counts for a lot in the house clearance profession that means we’ve been able to stand on our own two feet for many years and have managed to thrive in this competitive business. We’ve thrived in and around NW1 because we’re known as a trusted company, a company that can be relied upon to complete a house clearance in N1 to a high standard, ethically and in a professional manner. When it comes to entering people’s houses in Camden and handling possessions, people want to trust their team, and we’ve built this trust during the course of our time in the industry. So for trusted, local clearance professionals, call our team on 020 8610 9182 and book. Whether you have a tonne of junk overflowing from one of your spare rooms, have a garage that you use as a junk deposit space, or just have a few large items of furniture you want removed from your house, you can call us because we have services for everybody. We provide tailored house clearance solutions to the people of Camden. If your property in NW1 is in urgent need of a clear out, you’ll benefit from hiring one of our house clearance NW1 services. You can hire us to take care of anything you need clearing, and can book our service at a time and date convenient for you – a same-day service is also available. When carrying out house clearance tasks in Camden, it would be easy to just remove everything and then dump items straight into landfill. It would be easier and would save time – that’s why a lot of NW1 house clearance companies operate in this manner. But just because it may be easy and could save time, it doesn’t mean it’s better and the right way of doing things. At our company, we put a great deal of importance on eco-friendly clearances, so our service and your rubbish won’t be contributing to the environmental problems we’re facing today. We’re one of few companies that take the time to visit recycling plants with your unwanted possessions. Contact us and your items will be put to better use! There are numerous ways getting our Camden house clearance experts on board will benefit the state of your property. Firstly, if you’re based in the local NW1 district, we’re your local company and can come around in a jiffy, whenever you need us, to sort out all your NW1 house clearance Camden needs. You can forget about spending your time living amongst trash, because we’re here to sort out that problem, and by doing so, will open your eyes and get you thinking about what to do with your newfound space. 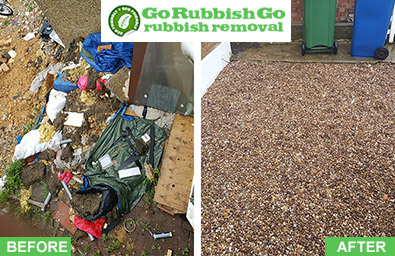 Get your rubbish cleared and your property will appear more spacious, cleaner and will just be an environment you’ll want to spend time in – call us and we’ll make it happen. Camden Town is often referred to as just Camden and is found in the centre of the London borough of Camden. Initially, the district was a residential one, but its strategic position next to the Regent’s Canal Towpath and the development of the railway led to its industrialisation in the 1800s. Today, the heavy industries have been replaced by retail outlets, entertainment venues and tourism. Camden has been famous for its street markets for decades, with Camden Lock market, Stables market, Camden Lock Village, Buck Street Market, Inverness Street market and the indoor market held on weekends within the building of a famous local nightclub, the Electric Ballroom all offering unique sights. St Michael’s Church, St Pancras Old Church and the Camden catacombs are just a few of the other noteworthy places in the area.